New Winners Are Crowned At The 30th Anniversary Tour Grand Finale. 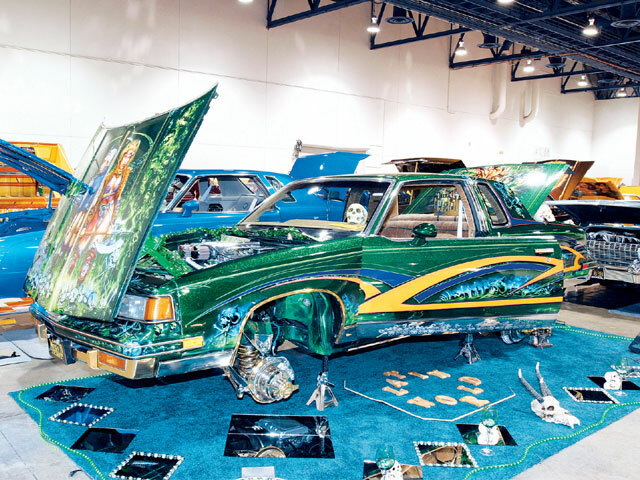 The 2007 Lowrider Magazine 30th Anniversary Tour reached its climactic conclusion at the annual Super Show held at Cashman Field in Las Vegas, Nevada, this past October. The event wouldn’t have been possible without the support of sponsors Quaker State, CCE Hydraulics, Thump Records and Wanted Wear, as well as all of the clubs and individuals showing their vehicles and in attendance. As Super Show Sunday began, we got to walk around and check out close to 700 vehicles that were pre-registered for the Tour grand finale. This giant indoor/outdoor event featured only the best of the best doing battle for top honors. With close to 20,000 people attending the show, the rows were filled to capacity. Spectators were clearly enjoying themselves in the cool (for Vegas) weather. The anticipation for the Super Show had been building all year, and the event came and went in a blur. The weekend just isn’t long enough for many of us. The Super Show setup began some three days earlier when people began to line up on Thursday night in order to be among the first to move into the show. Once you were in, it was all about setting up and cleaning up in time for the public and judges to see your pride and joy in the best light possible. Once again, several cars made their debuts at the Super Show. Vegas local Andre McGee broke out his “Blueprint,” a custom candy Oriental Blue ‘57 Chevy Bel Air convertible. The ragtop featured a flaked-out frame and a LS7 engine/700R transmission combination. Elite Car Club had been working on an ’86 Chevy Monte Carlo Luxury Sport. 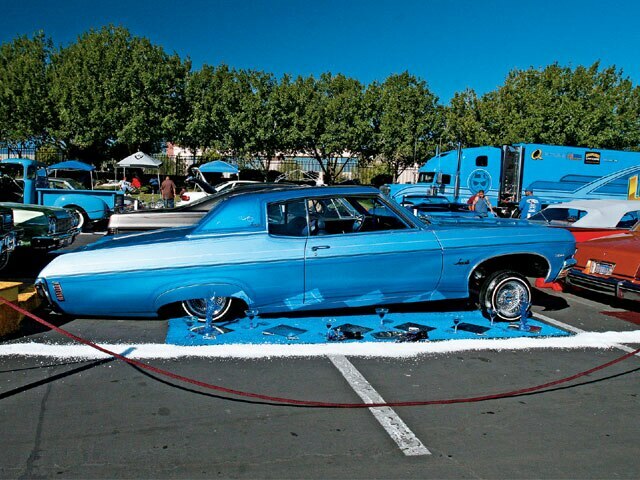 The candy blue G-body’s a full-custom frame-off vehicle that features a custom engine compartment and interior. The car was showcased on jack-stands next to Elite’s “Passion” ‘80 Volkswagen Jetta, and was on full display with mirrors underneath to show off every aspect of the custom build. Los Angeles C.C. had not made a statement at the Super Show since the debut of “Hustler ’63” a few years ago. 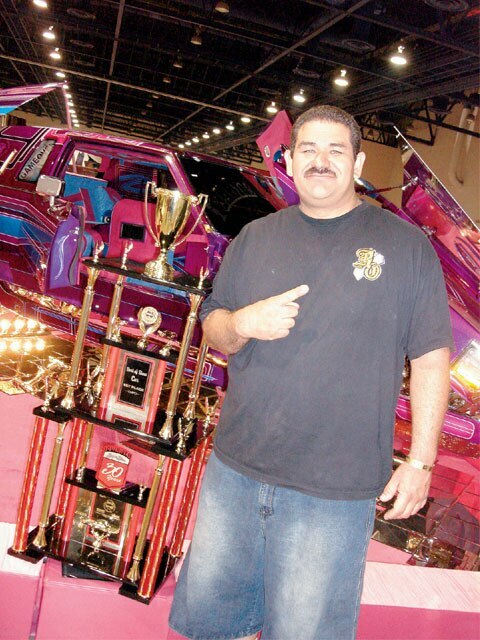 This time around, it was Jose Rodriguez’ custom ’64 Chevy Impala, “The Game Don’t Last Forever,” that was a few years in the making. The candy blue ’64 features a custom flake job and “Scarface” murals. Lifestyle C.C. 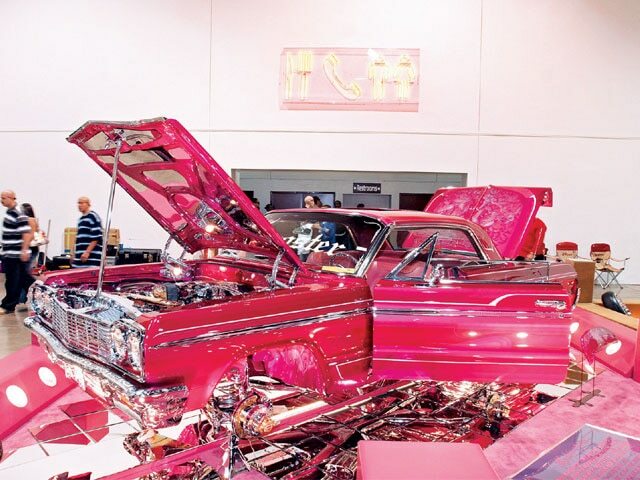 brought 10 new cars to “Sin City,” including the club’s latest Candy Factory creation, “Two Face,” a custom ’63 Impala with an intricate paint job. The ragtop owned by Albert Gonzales actually sports two different paint jobs, one on each side of the car, which guaranteed that the crowd needed to take a second look at this ride. There were several other clubs making a splash at the Super Show. Majestics C.C. had Todd Land’s ’63 Impala, “Main Event,” heading up the club’s row, which also featured Big Rich’s (R.I.P.) ragtop. Rollerz Only C.C. welcomed its latest member, “Royal Flush,” to the club. 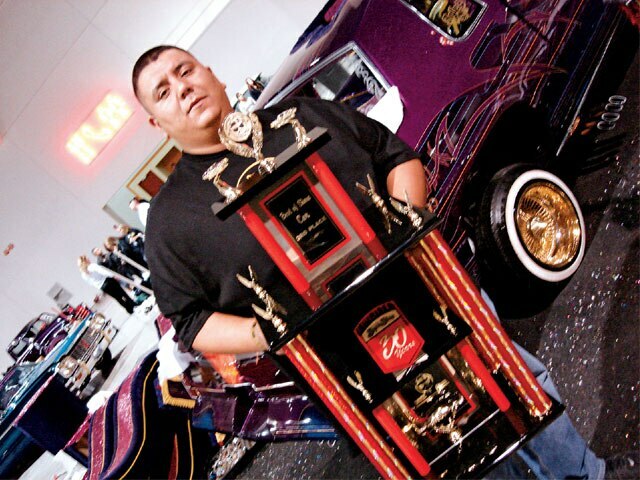 Rollerz Only also claimed the new Lowrider of the Year crown with Orlando Ceballos’ “Game Over” Cadillac taking the honor. Klique C.C. looked good as Robert Ceniceros’ pink ’70 Buick Riviera cover car (January ’08 LRM) was one of several vehicles representing the club. Uce C.C. did it in style displaying past and present champions in their 20×20 spots. Oldies C.C. had a strong lineup as well, including Chris Roark’s “Darkside” ’58 Impala, another recent cover car (November ’07 LRM). Ultimate Ridaz C.C. 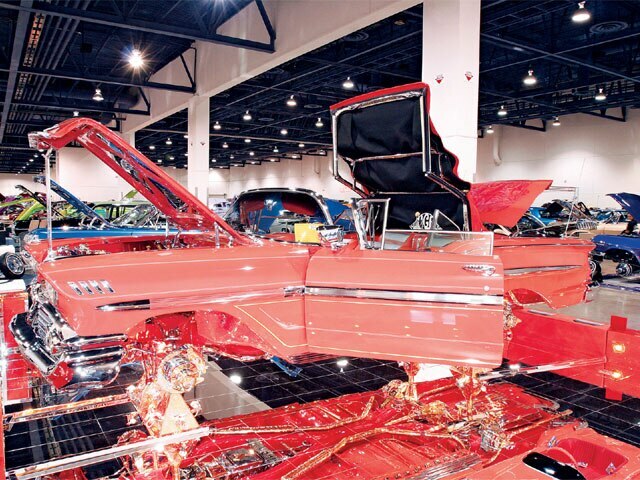 likewise showed strong with Thomas Sisneros’ ’61 Impala among the club’s collection of cars. Local Las Vegas clubs holding it down for their hometown included Street Players, One Luv, Royals and Desirable Ones. 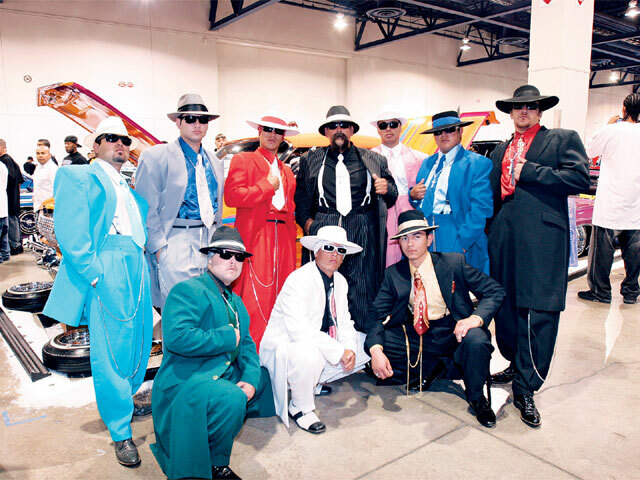 In general, the indoor areas were looking good and had cars that appealed to everyone in the sport, including Michael Tovar’s “Wanted ’37” Chevy Cabriolet (again a recent LRM cover car; December ’07), which won the Lowrider Excellence Award for its craftsmanship. This award is intended for cars that represent the lowriding community as a whole and this year’s winner did it with style. Zoot-suiters pose for a quick snapshot. Klique C.C. members get their Lincoln ready for the show. Rome, Danielle and Sergio show their support for the Movement by giving us a minute to snap their picture. Billy’s ride was on display in a tribute to his passing. Manuel showed us his Third Place trophy for Best of Show. 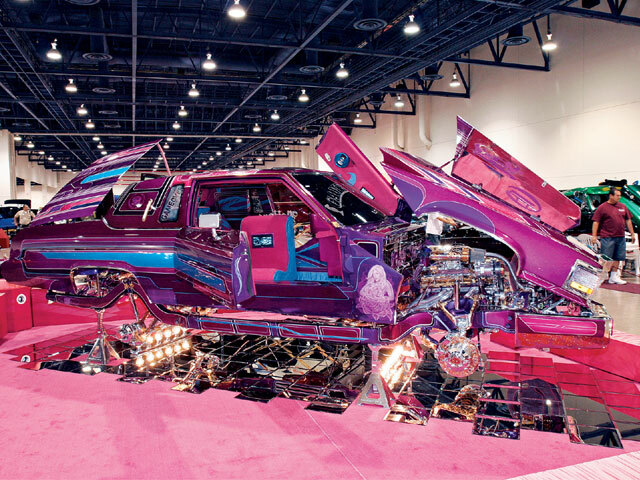 “Game Over!” Orlando’s Cadillac won Lowrider of the Year. These Vegas hotties had the guys going wild. The concert had MC Magic of NB Ridaz doing his thing and singing songs that included “Pretty Girl,” “So Fly” and “Notice Me.” Baby Bash sang his latest radio hit “Cyclone” right out of the gate, which got the crowd pumped up. 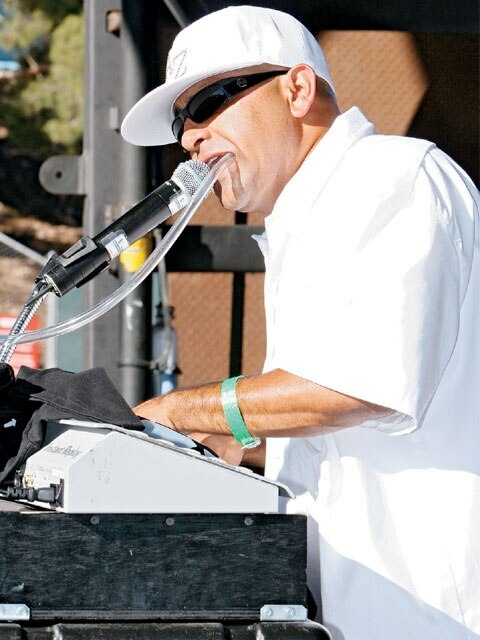 Bash also sang some of his classic hits like “Baby, I’m Back” and “Suga, Suga.” Bash also brought out his road dog Danny Trejo, who made a guest appearance during Bash’s performance. Pitbull sang it all, from his classic dance track “Culo” to “Shake” and the latest hits from his current album Bojangles, including “Fuego.” Once the concert had concluded, the Bikini Contest came off without a hitch. By the end of the day, the 2007 Super Show and the 30th Anniversary Tour had come to a close. There were several cars that didn’t make it to the Super Show for one reason or another, but they will be breaking out soon and should be ready for 2008. We’re already looking forward to the new Tour and the many memorable moments that are sure to come. Until then, keep building, and we’ll see you at a Tour stop down the road. Fernando Flores brought in his ’70 Impala from Phoenix, Arizona. Kid J and his sidekick chill for a snap. The girls were ready for Bash. A true rider, Jonathan drove his car in from Paramount, California. Latin World C.C. is all about supporting wherever it can. Pit Bull has no trouble getting the crowd going. Luis’s custom grille had everyone talking. This Vegas ’61 is a sure-fire winner. 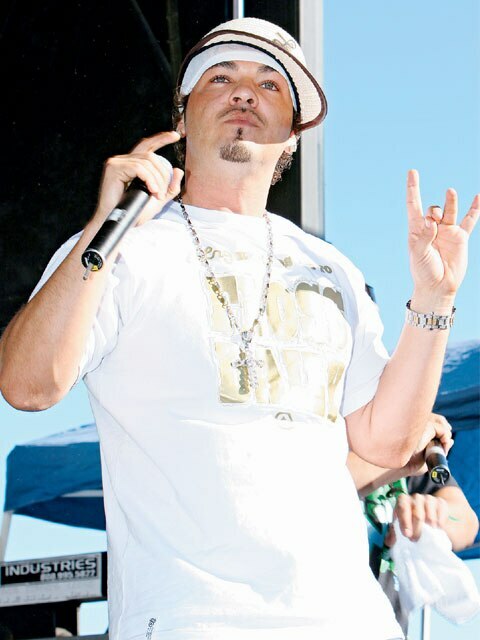 Baby Bash gets ready for the stage. The hot Bikini contestants always put on a show. MC Magic rockin’ it for the crowd.